Got this import of a compilation of all the NES Kunio-Kun (River City Ransom/Street Gangs related) games. 18 games in total, including all 3 Double Dragon games, Super Dodge Ball, the aforementioned RCR/SG, and all 6 of its sequels/spinoffs. Got these over the Christmas period, the 2 Xbox games and the the last of us were presents from the Mrs, I bought the other 2 myself. J.J. do they have the NES Kunio Kun game that had a graphic makeover to became Renegade over here? I know on the Gameboy the Kunio Kun game became Double Dragon 2 over here, so I assume the NES versions are kept as Double Dragon? Last edited by Shinobi on Sun Jan 06, 2019 9:50 pm, edited 1 time in total. Liking the look of that Kunio Kun collection...doubly so since I see there is a PS4 version as well. Renegade is indeed on there, in addition to its Nekketsu Koha Kunio-Kun Japanese version. That sounds class I will have to invest in that. Btw what’s your opinion of the Snes Kunio-Kun scrolling fighter? Is the all female scrolling fighter on the PC Engine cd an a official Kunio-Kun game or just a spin off? 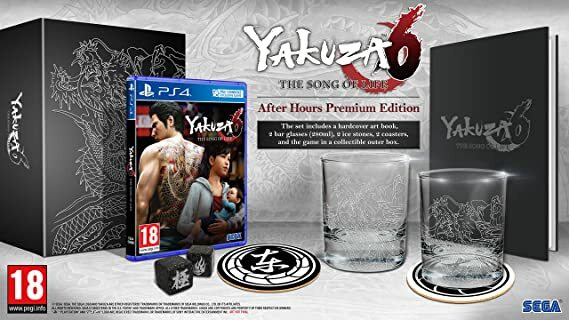 Picked up the 'After Hours' limited edition of Yakuza 6 from Amazon. They had it for £50-something (reduced) and I had a £20 voucher so it was around £35 in the end. Very pleased with that. Nice set which even comes with a pair of bar glasses. Just need to grab the steelbook edition of Kiwami 2 now and my collection will be complete. Just need to get them all played then! Nearly done Yakuza 5 and then it will be onto all of the PS4 games next. That reminds I saw PS Vita Ultimate Marvel vs Capcom for £15 are you still after that? I'd given up finding it to be honest. Only have CEX's left around me and the Vita stock is always trash. Its a nice edition for sure. One of the few times where a CE wasn't insanely priced and didn't feel like a cheap POS. Yeah I was really pleased with it, especially since I almost bought a different SE (card slipcase and some sort of DLC?) before seeing that this one was a thing. Heard good things about Judge Eyes. Unfortunately I've fallen behind on playing the main series games since I didn't do much gaming at all over the past few years. Need to catch up! DOGS AND CATS LIVING TOGETHER! !